"When someone asks you if you want to wear a mask made of human hair and stalk around a crypt distributing pomegranate seeds to people there's really only one answer - YES!" I am not a difficult man to please. Give me a subterranean labyrinth to wander about and I'm yours. Even better if it's a spooky church crypt. Even even better if it's jampacked full of interesting art. I saw some great work by Central St. Martin's students this year, including some ace works by artists like Boris Raux, whose molecular art exploits damn near every sense; Charlotte Wendy Law, who reconfigures objects in fascinating new ways, drawing new materials from the ether; and Susan Beattie, who seems to find endless ways to utilise a piece of pig's gut. The sense of atmosphere and occasion here was outstanding, the pieces slotting beautifully into the musty space. "My muscles wriggle about under my skin like a couple of badly behaved snakes, fingers curl up in strange patterns and occasionally my entire elbow tightens and jerks towards my body." Give me something new to see or hear and I'll dance a jig of joy. 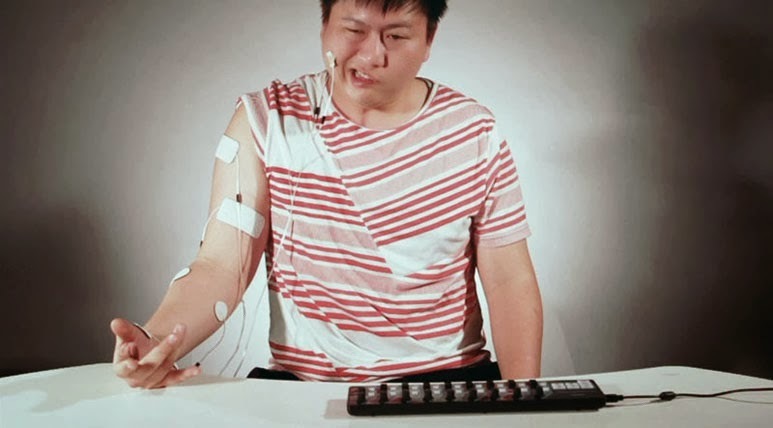 So when I was invited to meet Choy Ka Fai at arebyte Gallery, with the goa of being hooked up to shock pads and plugged into his mind control device I jumped at the chance. He didn't disappoint. As I noted at the time there's something of the mad scientist to him but maybe that's inescapable when you write a programme ominously titled 'Mind Control Interface'. When was hooked up to his device and the juice was flowing through me, the feeling of my arm jumping around and curling up was utterly alien - the experience of someone else's brainwaves manipulating my arm and giving me a taste of some disturbing future. Check out the video. "A damn neat exhibition, one that rewards close attention and is fuelled by pragmatism and the desire to comprehend systems that often seem arcane to the point of mysticism." Any exhibition that leaves you feeling smarter than when you went in is worth a shake in my book. Alice Woods' Dead Cat Bounce made the complex world of financial chicanery navigable by the layman (me). Despite trying to keep abreast of what the hell is happening in the economy, there seem to be infinitely complex layers of jargon that, if I was a paranoid man, would seem suspiciously like they don't want people to understand it. Woods busted through all that, representing this world with style and visual panache. I particularly dug the chilling deck of cards that listed every part of the state that'd been privatised over the last 20 years, a piece that cements in the observer's mind just how much we've lost. "The time and sweat that's gone into this is palpable, but effort alone doesn't make things worthwhile. What does is that Cornershop pierces the veil of everyday for just a moment, letting us briefly see the clicking, grinding cogs that power our brains, our bodies, our economies and our wallets." The pinnacle of these was Cornershop: an entire shop constructed from felt situated in the East End of London. It was an eye-catching work, gaining attention from around the world and being featured in all major newspapers, on loads of art sites and all over social media. It's weird to see something you like being praised by The Daily Mail of all places, but, importantly, in gaining attention from the mainsteam media Lucy didn't sell out. Lurking just beneath soft felt is razor-sharp satire and a keenly political eye. I dug Cornershop so much a felt tube of K.Y. Jelly now sits proudly on top of my mantlepiece. Can't wait to see what she does next.